A secluded refuge – In many suburban neighborhoods, they don’t leave much room between neighboring houses. So if you have a pool or hot tub in your backyard, it can be difficult to use them without feeling like you are being put on display. A privacy fence will help make you feel like you are in your own little world without having to worry about who might be watching you. Even if you don’t have a pool or hot tub, it is very relaxing to have a place to go where you can be alone and a nice, tall privacy fence can give you that. A deterrent – Even if you don’t live in a high crime area, you don’t want to make it too easy to access your property or possessions. A standard property fence is not too difficult to get over, so it might be tempting for trespassers or criminals. But, a solid privacy fence raises the difficulty just enough so that neighborhood thieves and vandals will probably go looking for an easier target. Protection from burglars and thieves – A standard fence won’t do much to deter a professional thief but a privacy fence might. Before a thief picks a target, they scope out the neighborhood to see which would be the best options. They watch to see if you have things like: a large dog, expensive cars, tough home security, etc. They also watch to see when you will be at home and when you won’t. A privacy fence makes all of that much harder to ascertain so they will often pass by your house to hit an easier one. Protection for your pets and kids – There are several different types of fences that can keep your children and pets safely in your backyard. For instance, chain link is often used in backyard fences because it is so affordable and durable. There is one problem though. Pets and children can be impressive climbers when the need arises and most chain link fences are only around 4-5 feet tall. Privacy fences are much taller and tend to be made out of smooth wood which does not offer paw or handholds like a chain link mesh would. Higher property values – When built by a professional and maintained correctly, any fence will raise the value of your home. Privacy fences just tend to make it go up the most. Since they are often built of quality wood and are tightly constructed they give an eye-catching, sophisticated look to your home. What types of materials are best for a privacy fence? Wood – Wood is easily the best looking and most versatile material for privacy fences. You can paint it any color you want and the cost is mostly dependant on the type of wood you choose. The downside is that wood fences require the most maintenance of any fence type. Vinyl – Vinyl is durable, strong and versatile. It has a higher upfront cost but that is offset by its almost complete lack of maintenance. Are you ready to get a little privacy for yourself? At Fenceworks of Georgia, we construct privacy fences with top quality materials by expert fence installers. We back our privacy fence installations with a 10 year warranty against defects in workmanship and materials. 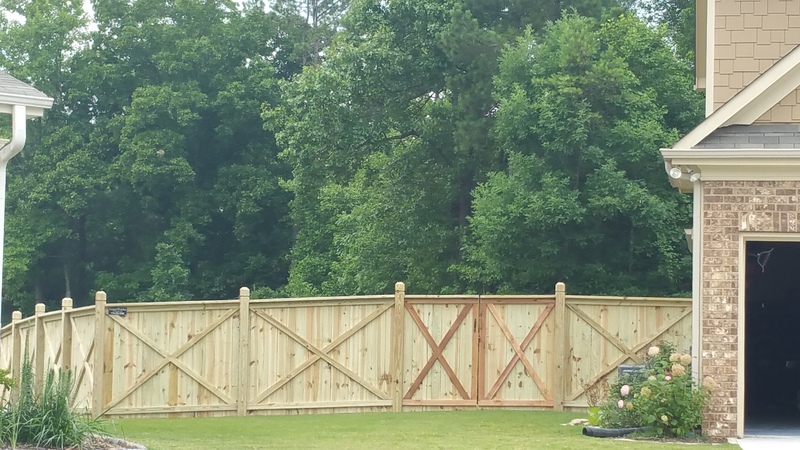 In addition, FenceWorks of Georgia will exchange up to 15% of the pickets within ten years of contract date – contact us for more details about our fence warranty at 770-452-9900 and speak with a fencing expert to get a free estimate.